The Walking Dead season 9 premiere was special in more ways than one. The acclaimed post-apocalyptic zombie horror returned to AMC on Sunday, October 7 with the first episode of its ninth season. During the last moments of the debut installment, entitled "A New Beginning," a tribute to late actor Scott Wilson flashed across the screen (via Deadline). "In memory of Scott Wilson," read the memorial card, which also displayed a photo of Wilson in character as the stubborn but fiercely loyal ex-veterinarian Hershel Greene. Wilson, who had played Maggie Greene's father Hershel from 2011 up until the character was offed in a particularly brutal way at the end of season 4, sadly died on Saturday, October 6 after a battle with leukemia. He was 76 years old. The tribute to Wilson came ahead of Talking Dead, the after show that airs immediately following each new episode of The Walking Dead. While some may have expected Talking Dead to acknowledge Wilson's passing or mention him and his character at some point during the episode, neither actually happened. Chris Hardwick, the brought-back Talking Dead host explained why this was the case, tweeting out that the October 7 episode was actually filmed last week. "Tonight's episode of #TalkingDead and the Season 9 #TWD pre-show were recorded at an earlier date, before the unfortunate passing of Scott Wilson (Hershel Greene on #TWD)," Hardwick shared from the official Talking Dead Twitter account. "Our hearts go out to Scott's family, friends, cast-mates, and fans." Several Walking Dead stars have honored Wilson's memory, taking to social media to remember the actor who also starred in The Ninth Configuration, In Cold Blood, The Great Gatsby, In the Heat of the Night, and more. "Never met a guy I liked more than this one here ever," Daryl Dixon actor Norman Reedus wrote in the caption of a photo of himself wearing a squirrel mask and sitting on top of Wilson. "I'm gonna miss u so much 'my main squizz.'" Khary Payton, who plays King Ezekiel on the show, shared a heartfelt anecdote about the time he first met Wilson: ""The first time I met Scott Wilson, he gave me a big hug and said that this thing I had become apart of… was a family. He said I had a responsibility to take care of it. I have tried very hard to do that, sir. & I will continue. I promise. See you on the other side, my friend." The Walking Dead executive producer Gale Anne Hurd also expressed her condolences on Twitter. "Scott was one of the greats, both as an actor and a man," she wrote. "We in #TheWalkingDeadFamily are truly grief stricken. He lived life to the fullest with his true love, his wife Heavenly. He is now a shining star in heaven spreading kindness and light forever. 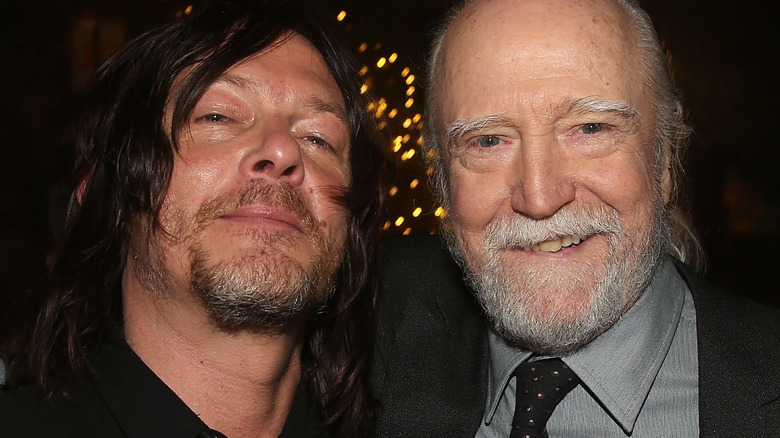 #RIP #ScottWilson." Though he's gone, Wilson certainly won't be forgotten — and we haven't actually seen the last of his character. The Walking Dead showrunner Angela Kang revealed at New York Comic-Con over the weekend that Hershel, along with Sonequa Martin-Green's Sasha Williams, will be featured in the series' ninth season. Fans can also expect Jon Bernthal, who first appeared as Rick Grimes' best friend and police partner Shane Walsh back in 2010, to pop up in some capacity throughout season 9. The Walking Dead will return for the second episode of season 9, "The Bridge," on Sunday, October 14 at 9 PM ET on AMC.